Today’s ‘Timeline Tuesday’ takes us through the 1930s – sugar production peaks, Pan-Am Clipper service begins, Hickam Airfield is constructed, ‘Aloha Shirt’ is trademarked and Doris Duke builds Shangri La. We look at what was happening in Hawai‘i during this time period and what else was happening around the rest of the world. A little over 100-years after it started, its buildings were almost refurbished and saved from demolition … to serve as a headquarters and factory for Crazy Shirts Hawaiʻi. For nearly 50 years the mill and refinery buildings were surrounded by thousands of acres of sugar cane fields with linkages by railroad to other mills and cane field sources. It began as the Honolulu Sugar Company, but over the years it went by a lot of names – but to most folks it was known as the ʻAiea Sugar Mill. September 1, 1888, Bishop Estate leased about 2,900-acres for a period of twenty years, until September 1, 1908 to James I Dowsett. Dowsett died and on August 1, 1898, the administrator of his estate sub-let the land to the Honolulu Sugar Company (formed in San Francisco and headed by John Buck.) That year, the Honolulu Sugar Company built a sugar mill in ‘Aiea. Almost two months later, Honolulu Sugar Company assigned the lease to the Honolulu Plantation Company. (US District Court) Operations expanded; the plantation and mill prospered. ʻAiea was named for a small shrub (Nothocestrum – used by ancient Hawaiians for thatching sticks (ʻaho) and fire-making) that once grew profusely there; it was plowed under to make way for sugar. The town of ʻAiea was created because of, and grew up around, the mill. By the early-1900s, all of the ʻEwa plains was transformed and planted in sugar; by the mid-1930s, Honolulu Plantation Company had more than 23,000-acres of land in and around ʻAiea. In 1910 the Honolulu Plantation Company helped with the reforestation of ridges and uplands; about 125,000 trees were planted in the fall of 1910 and 1911. In the 1930s the Honolulu Plantation Company employed about 2,500 people and refined more than 40,000 tons of sugar annually. Pre- and post-World War II impacts and military needs affected not only the expansion, but also transformed the future of Honolulu Plantation. In 1942, the Army built a cupola or lookout tower on top of the refinery and manned it day and night for the next three years. Honolulu Plantation was forced out of business by rising labor costs, low sugar yields and military confiscation of half its canefields and went bankrupt in 1946; the plantation acreage was sold to Oʻahu Sugar Company and most of the mill equipment went to a Philippines firm. Alexander & Baldwin Properties bought the site in 1993 and soon added a new liquid-sugar refinery in order to satisfy an increasing demand for soft-drink sweeteners. But granulated sugar production was becoming unprofitable. A&B sought to scrap the site and develop an industrial park. In steps Rick Ralston from Crazy Shirts to save the historic structure, restoring some to maintain the historic sugar flavor, as well as refurbish and reuse parts for the shirt production. However, costs for clean-up mounted and forced abandonment of the restoration – Bank of Hawaiʻi took over the property. The ʻAiea Mill was demolished in 1998. The ʻAiea Sugar Mill property was bounded by Ulune Street, ʻAiea Heights Drive, Kulawea Street, Hakina Street, and ʻAiea Intermediate School. Immediate improvements included dredging the entry channel; constructing the necessary infrastructure and other naval facilities; and building a drydock. That leads us to this piece’s title and the focus of this summary – Watertown. With all the work underway at Pearl Harbor, Hawaiian Dredging created a camp, more like a small city, to house and provide for the workers and their families. The town included a schoolhouse and adjacent Catholic Church, a theater, post office, at least one hotel and a number of stores and offices. 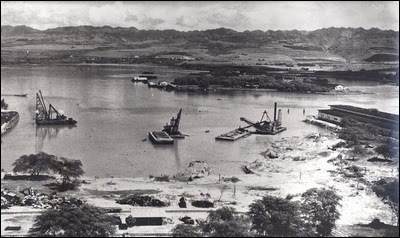 The image shows dredging at Pearl Harbor. (honoluluadvertiser) In addition, I have included more related images in a folder of like name in the Photos section on my Facebook and Google+ pages. The first successful air flight was in a hot air balloon in 1783; since heated air is lighter than cool air, the balloon would rise into the sky. The pilot would ride in a basket attached to the balloon and control the height by adding and subtracting more heat. The problem with hot air balloons is that you cannot go the way you want. If the wind is blowing west, that means you would have to go west, too. Flight took a new turn with the invention of the airplane in 1903; the military quickly became aware of its use in combat. “It can go faster and higher than horses,” said one Army aviator. The US War Department bought its first plane in 1909 and it was assigned to the new Army Air Corps. It wasn’t until the National Security Act of 1947 became law on July 26, 1947 that a separate, independent Department of the Air Force was created, headed by a Secretary of the Air Force. In Hawaiʻi, the US Army built Luke Field on Ford Island (constructed in 1917;) by 1928, they recognized the benefit of an expanded air presence, including in Hawaiʻi, and they began looking for a new site for modernizing the national defenses here. Site selection narrowed to about 2,200-acres of land bordered by Pearl Harbor channel on the west, Pearl Harbor Naval Reservation on the north, John Rodgers airport on the east and Fort Kamehameha on the south. The land was acquired from Bishop, Damon and Queen Emma Estates and on May 31, 1935 Hickam Air Field was dedicated (it was named in honor of Lt. Col. Horace Meek Hickam, a distinguished aviation pioneer who was killed in an aircraft accident on November 5, 1934, at Fort Crockett in Galveston, Texas. In naming boulevards and avenues on Hickam Field, the War Department deemed it appropriate to remember those early aviation pioneers who were killed in the Hawaiian Islands as a result of airplane accidents: Fox Blvd. -1st Lt. Robert E. Fox, killed 1920; Cornet Ave. -Pvt. Harman J. Cornet, 1920; Boquet Blvd. -1st Lt. Ulric L Boquet, 1921; Manzelman Circle -1st Lt. Earle R Manzelman, 1921; Vickers Ave. -SSgt. Vernon Vickers, 1921; Owens St. -Sgt. Ross Owens, 1922; Julian Ave. -1st Lt. Rupert Julian, 1923; Monthan St. -1st Lt. Oscar Monthan, 1924; Moore St. -1st Lt. William G. Moore, 1924; Catlett St. -2nd Lt Carter Catlett, 1925; Porter Ave. -TSgt. Aaron A. Porter, 1925; Worthington Ave. -1st Lt. Robert S. Worthington, 1927; Signer Blvd. -Capt. John A Signer, 1927; Kuntz Ave. -1st Lt Clyde A. Kuntz, 1929; Atterbury Circle -2nd Lt. Ivan M. Atterbury, 1930; Mills Blvd. -SSgt. Ralph O. Mills, 1930; Scott Circle -2nd Lt William J. Scott, 1931; Baker St. -2nd Lt. George C. Baker, 1931; Wilson St. -Pfc Hicks G. Wilson, 1935 and Beard Ave. -1st Lt. William G. Beard, 1936. 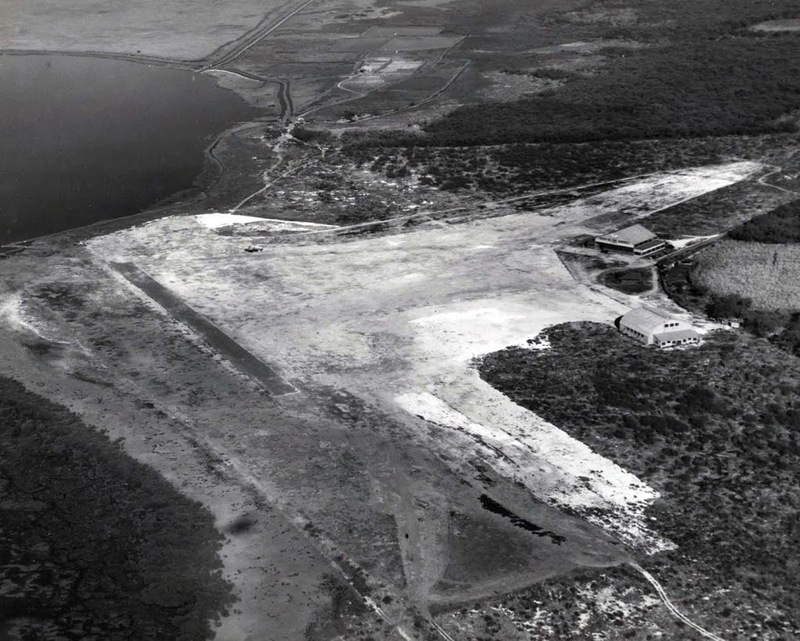 Hickam Field, as it was then known, was completed and officially activated on September 15, 1938. It was the principal Army airfield in Hawaiʻi. By the end of 1939, the Air Corps organization located at Hickam Field were, Headquarters, 18th Wing; 5th Bombardment Group; Headquarters Squadron, 5th Bombardment Group; 23rd Bombardment Squadron; 31st Bombardment Squadron; 72nd Bombardment Squadron; 4th Reconnaissance Squadron and 17th Air Base Commando (shortly after, the 11th Bombardment Group was included. In connection with defense plans for the Pacific, aircraft were brought to Hawaii throughout 1941 to prepare for potential hostilities. The only airfield large enough to accommodate the B-17 bomber (the Flying Fortress, at the time, the Air Corps’ most-modern airplane,) in May 1941, Hickam received the first mass flight of bombers (21 B-17s) from Hamilton Field, California. When the Japanese attacked Oahu’s military installations on December 7, 1941, Hickam Field was an important objective; because the success of the Japanese attack was dependent on eliminating air opposition and precluding US planes from following their aircraft back to their carriers and bombing the task force. Hickam suffered extensive damage, about half of its planes had been destroyed or severely damaged, and personnel casualties totaling 139 killed and 303 wounded. During the war years, the base played a major role in pilot training and aircraft assembly work, in addition to serving as a supply center for both air and ground troops. Hickam served as the hub of the Pacific aerial network, supporting transient aircraft ferrying troops and supplies to, and evacuating wounded from, the forward areas. On March 26, 1948, Hickam Field was renamed Hickam Air Force base. After World War II, Hickam was the US primary mobility hub in the Pacific comprised of the Air Transport Command and its successor, the Military Air Transport Service, until July 1957 when Headquarters Far East Air Forces completed its move from Japan to Hawaiʻi and was redesignated the Pacific Air Forces. Hickam Air Force Base supported the Apollo astronauts in the 1960s and 1970s; Operation Homecoming (return of prisoners of war from Vietnam) in 1973; Operation Babylift/New Life (movement of nearly 94,000 orphans, refugees and evacuees from Southeast Asia) in 1975; and NASA’s space shuttle flights during the 1980s and into the 1990s. Hickam now consists of 2,850 acres of land and facilities sharing its runways with the adjacent Honolulu International Airport as a single airport complex, operated under a joint-use agreement. 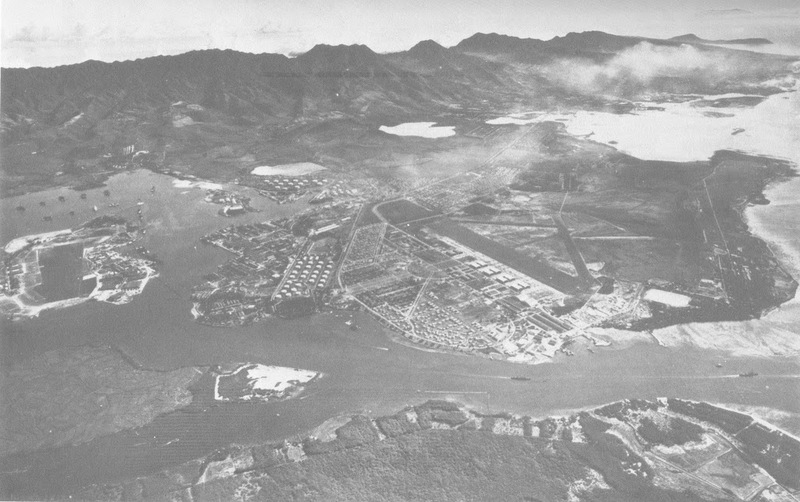 The image shows Hickam and surrounding areas in October, 1941 (Hickam.) In addition, I have added other images in a folder of like name in the Photos section on my Facebook and Google+ pages.